On the heels of our 1.5 release we’ve received great feedback and worked with Sandvox users who discovered bugs and requested additional adjustments. As a result, Version 1.5.2 boasts over 50 enhancements, including smoother handling of media and various improvements to pages and pagelets, with updates to page archives, contact forms, collection indexes, Amazon lists, photo grids, sitemaps, raw HTML editing, and QuickLook previews. Under-the-hood improvements speed file handling and offer greater stability. Version 1.5.2 also includes the latest version of the Karelia iMedia Browser (see below), which allows you to quickly and easily browse and drag photos, music, movies, and bookmarks directly into Sandvox sites. Read our full release notes. Version 1.5.2 is free to all registered customers, so download it today! Last week we updated our popular freeware utility, The Karelia iMedia Browser, to version 1.1.2. This new version fixes several issues and improves live updating of media libraries. This is a standalone version of the media browser found in Sandvox, useful for browsing photos, music, movies, and links for dragging into other applications. Download the new iMedia Browser. The Digital Programs and Systems group at the George Mason University Libraries found itself in an interesting position: With a campus-wide license reaching its end, how to help users migrate to new software tools in a clear and efficient manner? A website seemed like the logical choice, but how to get one up and running, quickly? The answer: Sandvox. Within an hour, staff had the Sandvox site up and running, available to provide faculty, staff, and students with the information they needed. Since I wrote this post I’ve been digging around the help file and various sites on the web. Upgraded my registration to “pro” so I could make use of inline HTML within your templates. Very nice. Also had a brief but very helpful interaction with your support group pointing me to where I could get the code to run the mailme.php program locally rather than relying on your services.karelia.com site. Anyway, I’m now a fan and will be happy to recommend Sandvox. Kym Nippes chose Sandvox to showcase her and her husband’s fine art and photography and their affection for Leopard Catahoula dogs at Just Plain Pix. Substituting their own image in Sandvox’s Cathedral design—a favorite of many artists for its generous size—gives visitors an immediate sense of Kym and Andy’s style. In addition to a blog that chronicles the inspiration behind their work, Kym and Andy have used Sandvox Collections to offer galleries of their pastels, photography, and portraiture, and have set up special features—including a separate blog within the same site—to discuss Leopard Catahoulas. Some people may describe shopping as a passion, but Bob Bruennig’s passion is the store itself, particularly the grand department stores. Using Sandvox to create the “Remembering Great American Department Stores” site, Bob is building a resource with historical, social, and architectural information about building around the country. The “Two Lines” design provides a clear structure that sets off galleries from indices and links to additional information and related sites. It’s a great reminder of how the web helps build communities, letting people with shared interests connect and exchange information more easily than ever before. Want to share a success story of your website? Let us know! Gary Byrd of Sandvox Web Designs recently announced the availability of “Override,” the latest addition to his design packages. Available in two variations, Dark and Light, both versions allow for custom headers, logo support, and navigation links above the header. Demos of Gary’s designs give you a sense of many of the standard Sandvox elements, including page layout, pagelets, blog entries, and photo galleries, so visit Sandvox Web Designs to see if Override captures the look you’ve wanted to achieve. With all the new products coming into the market it’s often hard to distinguish the helpful from the hype-full, so from time to time we like to share news of other independent developers’ products that have caught our attention. Today we’d like to spotlight Serene Saver Pro, the first “moving wallpaper” for the Mac. We were quite impressed with the application when we met its developers earlier this year, at a neighboring Macworld Expo booth. More than an animated screen saver, Serene Saver Pro brings your desktop to life and lets you create an environment that suits your mood. Choose from over three dozen high-definition scenes shot in locales around the world for a living backdrop to your work. Each scene is accompanied by a soothing soundtrack that can relax, focus, or take a video vacation. Many customers choose Sandvox for the ability to easily customize their websites. 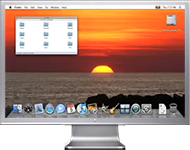 Similarly, Serene Saver Pro brings easy customization to your desktop and screen saver, allowing you to import home movie footage of your choice. Relive scenes from your last vacation, revisit an inspiring vacation destination, watch your kids at play... whatever your choice, Serene Saver Pro lets you enjoy it, front and center, on your desktop. Amuse, Inc. has graciously agreed to offer Serene Saver Pro at a significant discount to Karelia’s customers and friends. Until the end of November you can purchase Serene Saver Pro for a 40% discount from its normal price of $49.95. Simply visit http://www.serenesaver.biz/ksw.php to buy Serene Saver Pro or to download their free 10-day demo. Don’t forget to use the coupon code serenitynow to receive your discount. The latest version of the Sandvox Developers’ Kit is now available in beta, and will be available for distribution soon. If you’re a Cocoa developer interested in creating Sandvox plugins, contact us and let us know of your interest.